* Details on the core True10 backgrounds, plus rules for playing orcs, hobgoblins, goblins, and the fiery azhar. * Over a dozen paths for the three core roles including the cultists, the assassin, and pirate. * Rules expansions for skills and feats, including new skills such as Knowledge (forbidden lore) and cool feats like Divine Domain, Dying Curse, and Bloodline. * Guidelines for incorporating madness and corruption into your Freeport adventures. * Expanded equipment tables including poisons, drugs, new weapons, and general gear, and a new pricing system for your True20 Fantasy games. * Rules for rituals include several sample profane rituals including Awaken the Dead and Conjure Demon. * New supernatural items such as Beamsplitter, Reaverbane, and the coveted Rod of the Buccaneer. * Over 50 new monsters including hazards like Dead Man's Brain and vile horrors such as the fleshraker and unspeakable ichor. * Statistics for common folk of Freeport such a watchmen, thieves, and merchants. * Statistics for over 75 key characters described in the Pirate's Guide to Freeport including heroic allies such as Buster Wallace and K'Stallo and terrible villains like Red Alice, Prendag the High Death, and Kothar the Accursed. * Fury in Freeport: A new adventure to help you launch a brand new Freeport campaign! 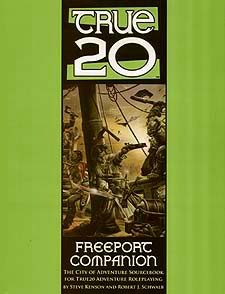 The True20 Freeport Companion is your rules guide to exploring Green Ronin's Freeport, whether as a daring hero, looking for adventure, or as a Narrator seeking new worlds to explore, this sourcebook is an indispensable accessory for fans of both Freeport and True20!